MANILA, Philippines - After President Rodrigo "Rody" Duterte's inauguration yesterday, it's now Gen. Ronald "Bato" Dela Rosa's turn to take an oath and assume the PNP Chief of Police position today, July 1 at Camp Crame in Quezon City. Gen. Bato Dela Rosa melts the heart of netizens for showing his soft and humorous side. Like his long time boss, former Davao City Police Chief Dela Rosa is known to be tough and savage towards the criminals, thus, earned his nickname "Bato." During his speech at the installation ceremony, Gen. Dela Rosa warned the rogue cops who are involved in drug trafficking and extortion to surrender to him in 48 hours, or else, they will be apprehended. It has been Duterte's propaganda even during the pre-election period that he will try to wipe out the illegal drug trade in the country. He warned all the pushers to yield or get killed. As to date, there are over thousands of small and big time drug pushers and users who have voluntarily surrendered in authority to avoid any misfortunes when Duterte takes the helm like what happened recently in different parts of the country where the suspects resisted police arrest and got killed. Gen. Dela Rosa is in full support of President Duterte's campaign against illegal drugs so he's starting the clean-up in his own backyard, the PNP. But little do we know, the tough-looking General has a soft side too. 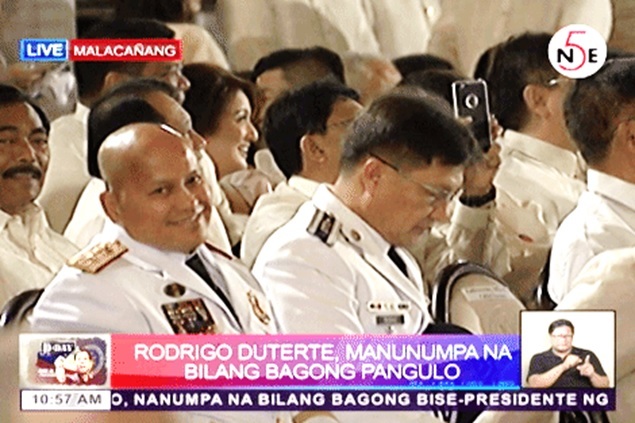 Yesterday, during the presidential oath taking event, Bato, who was in immaculate white type A uniform was caught on camera bobbling his head with an ultra-wide smile on his face. He caught the attention of the netizens and his video went viral at once. It brought tons of good vibes to millions of Filipinos. Just like his boss, President Rody, Gen. Bato also has a good sense of humor. But what was his reason for doing that goofy act? A screenshot photo is now circulating online that might be the answer for Chief Dela Rosa's epic bobble head video. 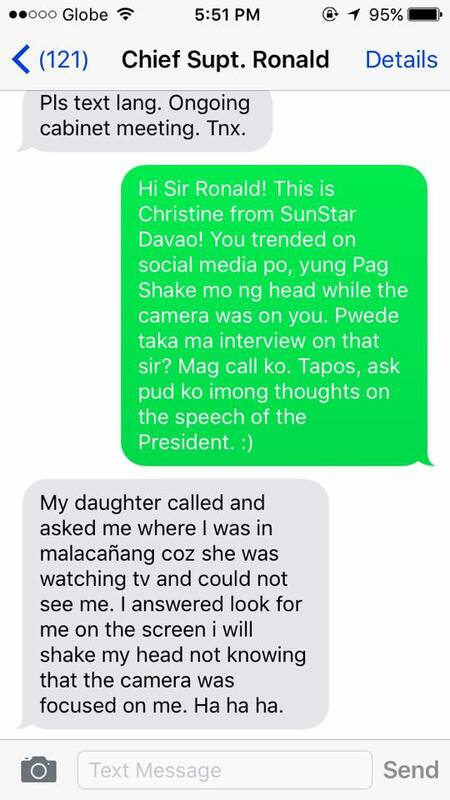 A Sunstar Davao staff, named Christine was asking Bato what might the reason be for acting funny on camera yesterday at the inauguration because it trended online. In the conversation, Gen. Dela Rosa replied that his daughter wanted to see him on TV and asked him where he was. He told his daughter to look at the TV immediately and he will shake his head so she can recognize him. He wasn't fully aware that the camera was solely focused on him followed by a boisterous text laugh. The photo still lacks veracity whether it was really from Gen. Bato Dela Rosa or was simply created by someone who appreciated the Chief's humorous gesture. Whether real or not, Gen. Bato Dela Rosa is one cool father and Police Chief! On behalf of The Summit Express, congratulations on assuming the top PNP post!